We can take away your old bed as long as it is a "flat" or "standard adjustable bed" (slatted). We can remove other types of beds such as adjustmatic, craftmatic or sofa beds but there is an additional charge for this. To avoid any unexpected charges, please be as specific and accurate as possible with the information about your old bed. 1. Do you set the bed up in the bedroom and is it included in the price? 2. What sizes do the beds come in? 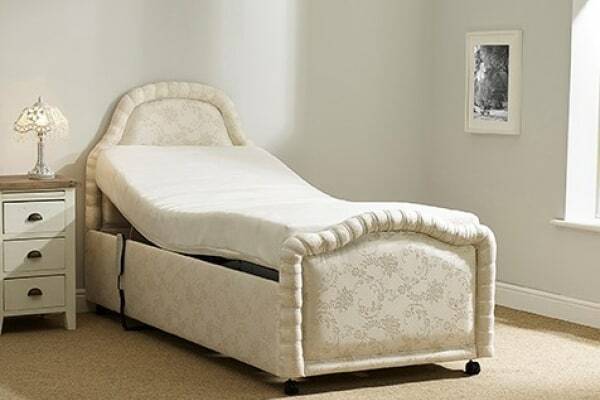 All beds come in 3ft, 3ft 6, 4ft, 4ft6, 5ft and 6ft excluding the Chatsworth and Leather Beds. 3. How high is the bed from the floor to the top of the mattress? About 22 inches, the standard height of a flat bed. 4. Can you alter the height, length or width of the bed? 5. Can you deliver overseas? YES but the bed will be shipped at your expense, we will organise this for you. 6. What is a dual bed? A dual bed is where each side of the bed will have individual controls so one person can lay flat whist the other can sit up and watch T.V. for example. 7. What is a double bed? This is where the whole of the back of the bed raises and all of the leg section raises together (not necessarily at the same time) so both people are in the same position. 8. 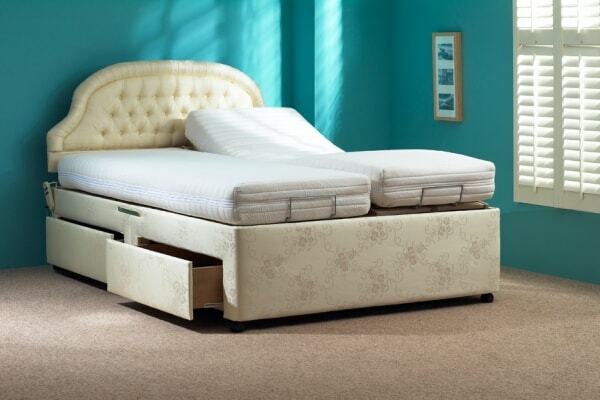 Are your beds fully adjustable? YES they all rise at the back, neck and foot section to contour exactly with your body except the Chatsworth which just rises at the back. 9. What happens if I do not like the mattress? For mattress only purchases a mattress exchange is possible but refunds are not. 10. How soon can you deliver our bed? Delivery is generally 10 to 14 days (Scotland up-to 21 days). We can deliver within 3 to 5 working days for those who have family coming out of hospital or those of you just in a hurry, this costs an extra £145 or £295 for a Turning Bed as we have to re-organise deliveries and or do a special trip for that particular delivery. Due to geographical restrictions and courier coverage limitations, "Fast Delivery" is not available in Scotland. Also, for the same reasons, there may be a delivery charge in cases where delivery is required to remote areas. 11. Do I have to pay VAT? If you have a chronic medical condition (i.e. ongoing that is not likely to get better in the near future) no. All the prices quoted are exclusive of VAT this is because if you are looking for one of these beds you probably have a qualifying condition (see list in "Your Health" section (top of the home page to the left) to check or talk to a representative on the telephone if you are unsure or you can talk to your local VAT office we will gladly give you the telephone number. 12. What happens if I find I have ordered the wrong size bed,it is the wrong height or the wrong type? Example: I have ordered a double bed instead of a dual bed. It is crucial you measure the size of the bed before ordering as a charge of £175 will be made to collect, dismantle and reassemble a new bed this must be done within 14 days. As this is a bespoke item then we are unable to include it in the 7 day trial and can not be cancelled under any circumstances after 48hrs of ordering. We try to go above the legal obligations we have as a company with our 7 day trial as once a mattress has been slept on we do not by law have to take it back (due to cross contamination) we do this as a peace of mind offer on all standard beds so this excludes all special orders unless agreed in writing.